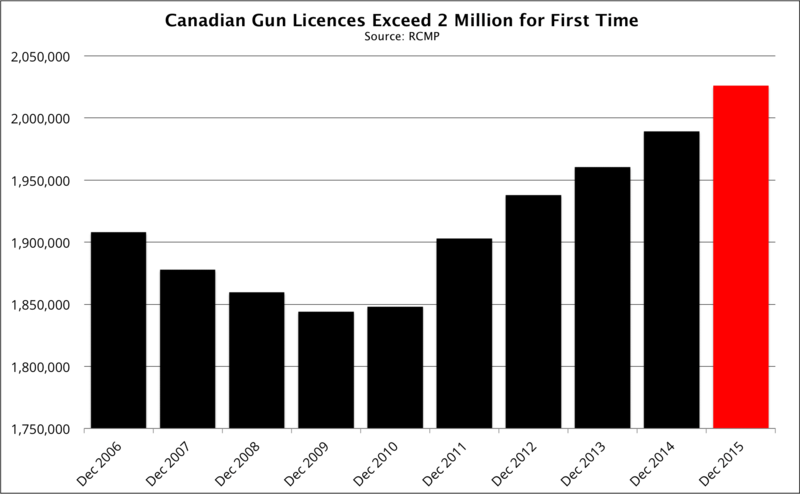 The number of Canadians with gun licences exceeded 2 million for the first time last year, boosted by shooters in British Columbia, Alberta and Ontario. The country counted 2,026,011 individual firearms licences as of Dec. 31, the Royal Canadian Mounted Police said in its Commissioner of Firearms report for 2015, published online on April 12. That compares with 1,989,181 permits at the end of 2014. About 7 percent of Canadian adults have gun licences, more than the percentage who play golf, hockey, soccer, baseball, basketball or who ski. Last year marked the sixth consecutive annual increase in the number of permit holders at Dec. 31, as more men and women want guns for recreation, competition, hunting and collecting. It is illegal in Canada to buy or own a firearm or ammunition without a police-issued licence, and getting one is complex and costly. A standard Possession and Acquisition Licence (PAL) allows you to own certain shotguns and rifles, but you need a so-called “Restricted” PAL to buy handguns or AR-15 rifles. Each type of permit requires attending 8 to 10 hours of class costing $120 to $200, passing a test, and sending an application to the RCMP with a non-refundable payment of $60 for a PAL or $80 for a “Restricted” PAL. The police generally take about two months to check your background, contact your references and, if they decide to approve, to issue a permit. Licences are valid for five years. Last year, 36,830 people went through that process and obtained licences. British Columbians led the increase with 13,955, followed by Albertans with 13,751 and Ontarians with 8,418. The number of license holders in Quebec fell by 2,030, and in New Brunswick by 1,165. The number of Canadians who use firearms legally or who support shooting could be two, three or four times higher than the number of licence holders. In many families, the father is the only one with a permit, even though his wife and children also shoot or hunt. Many people with permits take unlicensed friends to the target range, and many ranges offer unlicensed visitors the chance to shoot under supervision. In 1998, before ownership licences became mandatory, a report by the Department of Justice estimated that about 3 million civilians owned firearms, representing some 26 percent of households. In addition to more Canadians getting licensed, we're also buying more so-called “Restricted” firearms, such as pistols, revolvers and AR-15s. The number of such guns owned by individuals and businesses climbed by 9.5 percent last year to 795,854, the RCMP report said. Every province and territory recorded gains, led by Ontario with 37,946, Alberta with 10,943 and British Columbia with 8,508.